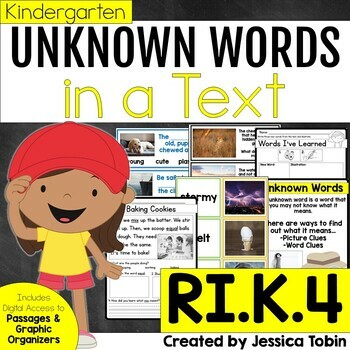 -This pack is packed full of ideas and resources to use while you are teaching the standard RI K.4. 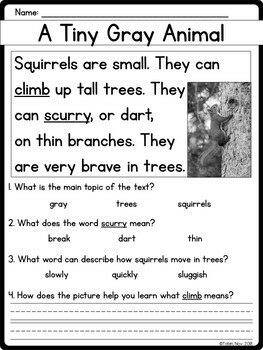 It comes with lesson plans, passages, graphic organizers, and small group activities. 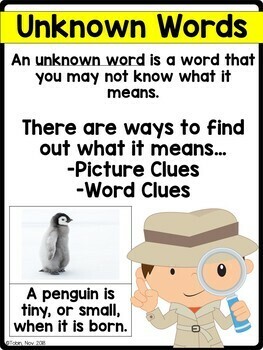 If you are not teaching Common Core, then the pack is still valuable to use when teachings students to ask and answer questions to determine the meaning of unknown words in an informational text. 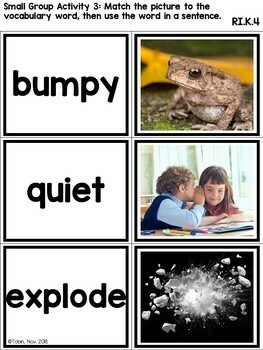 It teaches them to use context clues in sentences and pictures to determine vocabulary word meanings. Please check out the preview to see ALL that you're getting! This purchase is for one single classroom only. If you're interested in sharing with other classrooms, make sure to buy the extra licenses for a discount through the TeachersPayTeachers tool. If you are interested in a site license, please contact me for a quote at jessica.L.tobin@gmail.com. SAVE BIG! Buy this pack in 2 possible bundles. Click here for the READING bundle. Click here for the ELA ALL-YEAR curriculum bundle.